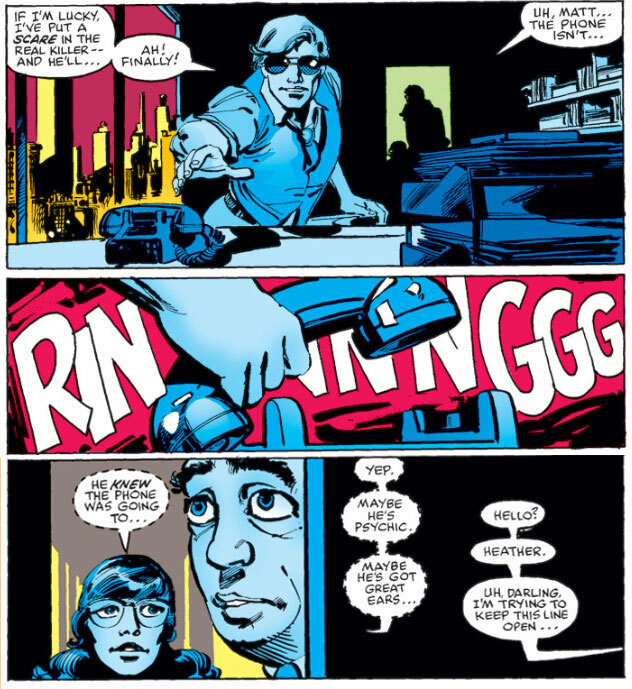 Daredevil's wacky power #19 - "I sense a phone call"
What’s this, you ask? Two phone-related wacky powers back to back? Why yes! Some of you may recall Wacky power #18 which saw Matt perform a physically impossible trick over the phone. It turns out that this is not the only piece of telephone magic Matt has stored up his sleeve. He can also tell when the phone is about to ring. And we’re talking seconds before it’s about to ring. Below is a scene from Daredevil #184, by Frank Miller. Have you learned nothing from Bendis? He just hears the person dialing from miles and miles away of course!